River cruise itineraries include voyages through countries like Germany, Austria, Switzerland, Belgium, France, Netherlands, Hungary, Czech Republic, Italy, and more without the usual inconveniences of packing and unpacking. The "Floating Hotels" cruise by beautiful cities, villages, castles and vineyards. 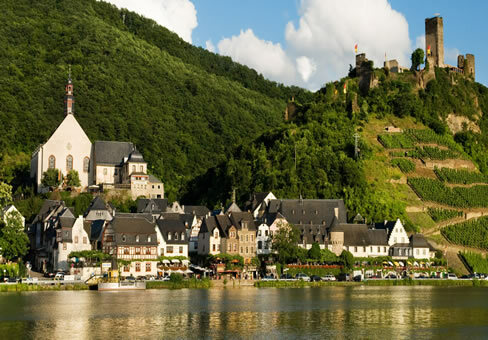 On the Rhine, a variety of itineraries depart from Amsterdam, Mainz and Basel. On the Danube, voyages depart from Passau, Germany (near Munich), and cruise to the Austrian and Hungarian capitals of Vienna and Budapest. In Italy, we offer round trip cruises out of romantic Venice visiting fascinating cities like Verona, Ferrara, and Parma. On the Rhone, ships sail round-trip from Lyon, France to the Burgundy and Beaujolais wine regions and the Mediterranean style cities of Avignon and Arles as well as one-way between Lyon and Avignon. River cruises in comparison to barge cruises are different in that they cruise the rivers of Europe rather than the small canals. The ships are larger and hold from 80 to 200+ passengers. You will often find a swimming pool, beauty salon, gift shop, dancing and entertainment on board where you will not on the barge cruises. In contrast, where the smaller barges include shore excursions, have bicycles for guests and often have open bar, the river cruises do not have an open bar policy, bicycles, and most do not include shore excursions.